My 4-year-old son thinks he knows what a haka is. He’s seen the All Blacks do it on the telly and will even have a pretty random (and not entirely culturally appropriate) go at doing it himself. But it’s only when the taiaha of a Maori warrior whizzes past his nose — seemingly (to this nervous dad, at least) just centimetres from an impromptu facial reconstruction — that my boy really gets some understanding of the power and awesomeness of a Maori greeting. We’re sitting in the front row of the whare runanga at the Waitangi Treaty Grounds. The Treaty itself was signed just outside. 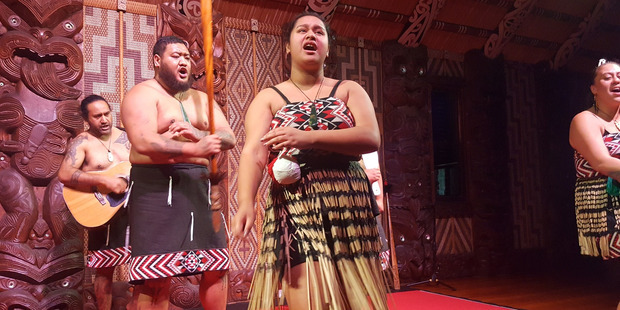 A small concert group puts on a daily half-hour show celebrating Maori culture, music and history. It’s a chance to get up close and personal with the local iwi. Almost too close for some. A league fan wearing a Warriors jersey and seated just along from us in the front row gets an even heartier welcome. As the weapons and techniques of Maori warfare are explained, a giant warrior leaps forward and flashes his mere — the short, broad-bladed weapon that proved so popular for impromptu facial reconstruction in the days of Te Rauparaha — around the ear of the Warriors fan. “Go the Warriors!” Says the, er, warrior, before taking his place back in the ranks. There are few things in the world that move as quickly as a group of children under the age of 7 going through a museum in which their parents would love to slowly dawdle. 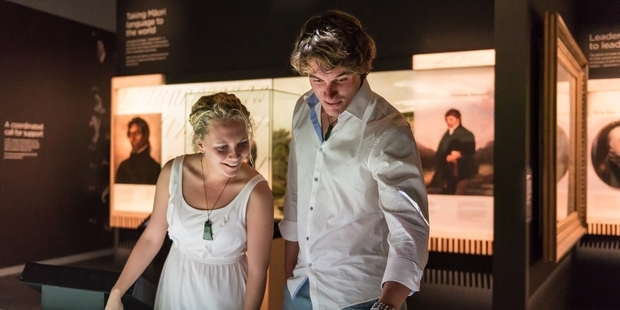 The fabulous setting of the Museum of Waitangi is no exception. My boy, perhaps inspired by the haka performance, blasts like Beauden Barrett past the history of New Zealand’s early flag. Thankfully, there are videos and interactive touch screens to hook the modern kid’s attention. This lovingly curated collection tells the story of our nation’s awkward conception and hurried birth, all the way through to the gangly pre-teen years into which we’re presently headed. Many of the items on display tell bloody and, at times, grisly stories. Every child must be impressed by a man so determined to make a point that he cuts down a flagstaff four times. The stories are told with all the devices of the modern museum, from interactive touch screens to muskets and mere. 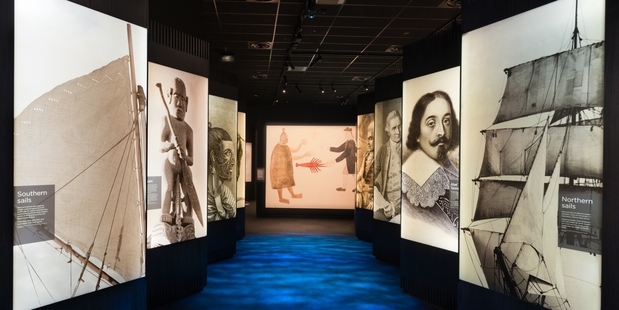 From the first tentative contacts between Maori and Europeans — including some dastardly Frenchmen — to the signing of the document itself and the formalisation of the relationship between Maori and Britain. There are guns and axes; maps, blankets, uniforms and portraits of people whose faces suggest they did a lot of hard living in really hard times. Even the manicured British officers. In the Documents Room, you can examine reproductions of the Treaty pages and seek out the version that passed through your hometown. With rushed translations and pages sent around to the four corners for signing, The Treaty’s path, like that of the country it formed, was often murky. But, for better or worse, those moth-eaten pages have got us this far. Displays in the Museum of Waitang. The exhibition finishes with a wall of quotes from modern New Zealanders about what the Treaty means to them — the likes of Dame Claudia Orange are up there along with some other very thoughtful, intelligent Kiwis. You’ll also find quotes from Michael Laws and Sean Plunket. This is rite-of-passage stuff: every Kiwi child must be brought to Waitangi. Displays in the Museum of Waitangi. Equally, there is an unwritten law that whenever you walk past a large cauldron in a public area, you must place any children you happen to have with you inside the cauldron and get a photo. In Russell, we tossed our kids into a trypot; once used for boiling whale blubber, another hint of the grisly history of the place. It can be tricky to reconcile the sight of today’s twee and respectable tourist township of Russell with the notion that this place was once fantastically dubbed the “Hellhole of the Pacific” and bombarded by the Royal Navy. On the cobbled footpaths where cannon shell once fell, today’s visitors buy flat whites and pottery. It’s good to live in the age of the flat white, but it’s crucial to ponder how we got here. The Bay of Islands is not just a pretty place. Between Russell and Paihia, there are plenty of opportunities to dine well. One of New Zealand’s grandest and most storied pubs, the Duke is an institution of the north. The recent re-launch comes with a kitchen to match that of any high-end pub in the country. The best spot for downing Waikare Inlet oysters. Visit their listing. The fish on your plate will impress the adults, but it’s the fish in the massive in-restaurant aquarium that will hook the kids in. Excellent family fare. Visit their listing. You might reasonably deduce that the vogue for Southern US cuisine has reached peak 10-gallon hat when you walk into a rib shack in the north of New Zealand. But once you’re face down in a pile of Paihia’s Southern barbecued goodness, you’ll see the logic of it. 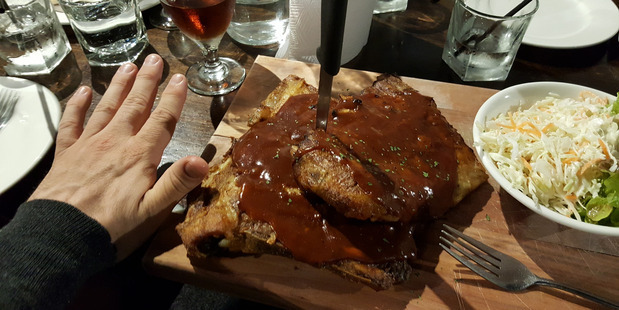 Jimmy Jack’s, with sweet and sticky hunger-whacking ribs, has become an institution of dining out in Paihia. Visit their listing. Also on the main wharf — alongside 35C South — you’ll find Charlotte’s Kitchen, operated by the crowd who took over the Duke, in Russell, a few years back. Charlotte’s, with a modern menu and excellent cocktails, has the best views of the lot. Visit their listing. Air New Zealand operates up to four daily return flights from Auckland to Kerikeri. Find out more about getting to and around the Bay of Islands. 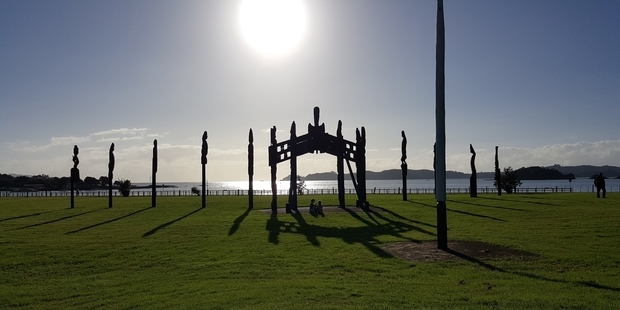 Visit the Waitangi Treaty Grounds and museum. Are dolphins your thing? Check out dolphincruises.co.nz.